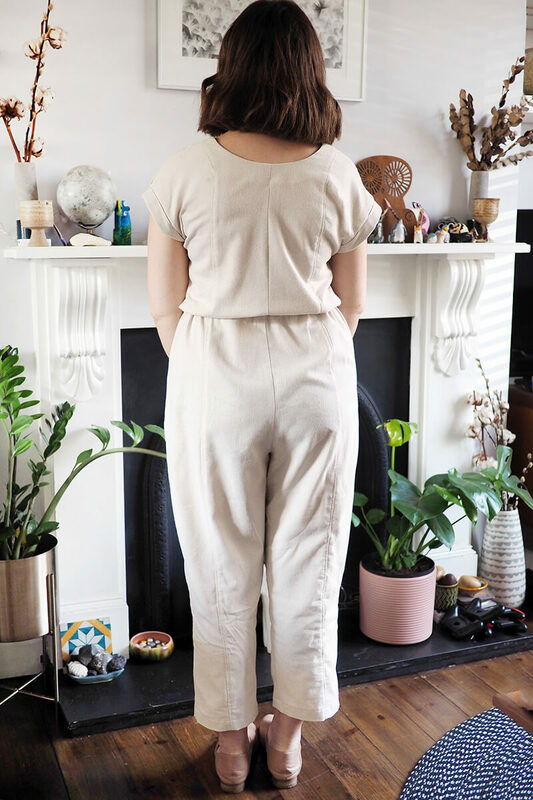 I toiled the True Bias Yari Jumpsuit last year sometime and for whatever reason (…winter, I guess) had a massive delay before picking it up again. 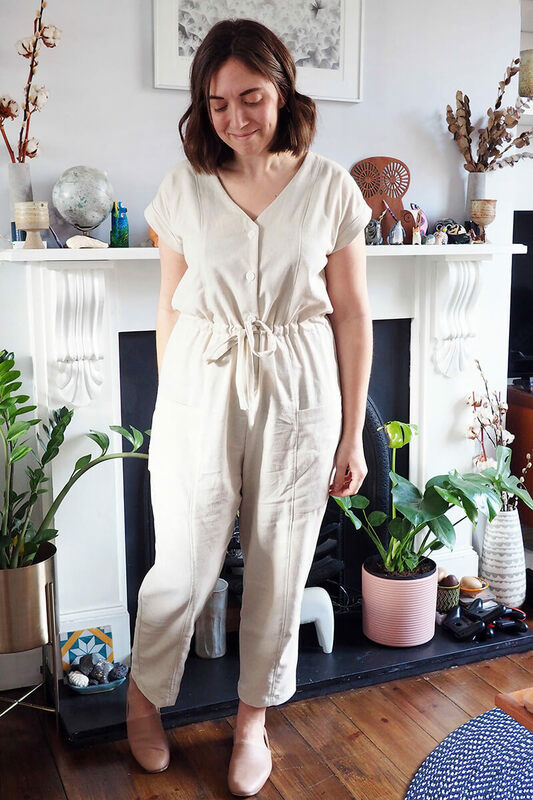 But then I saw Sarah’s winter-white version and this Asos cutie and got on the lookout for creamy fabric to make my own. Just in time for spring, hint hint weather. I was going for a relaxed silhouette but tried the suit on partway through construction and decided it did need waist definition. Also the crotch and pockets were hanging very low like it was too long in the body. 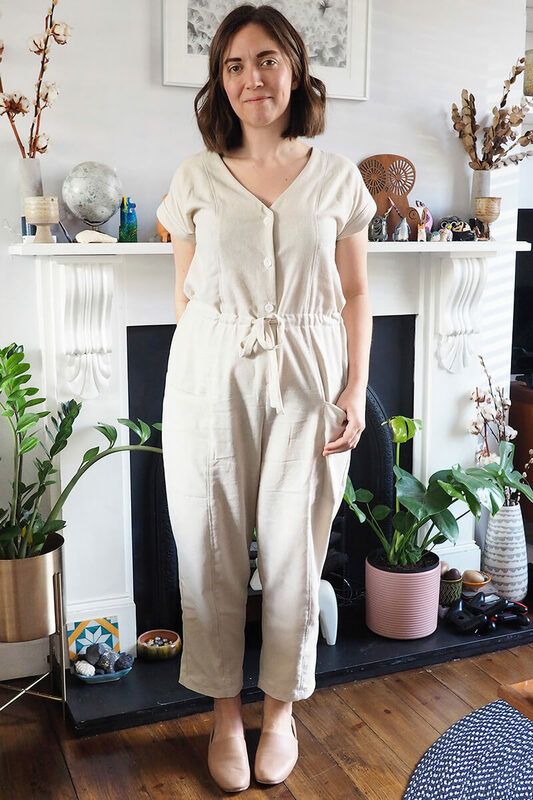 I didn’t fancy the side D-ring ties included in the pattern – they look a bit awkward and unflattering to me – so I sewed a drawstring channel to the inside waistline and made skinny ties to feed through. The slight blousing effect this resulted in also fixed the length issue! Here’s the channel from the inside. Mmm, I love all these creamy stitch tones against each other. 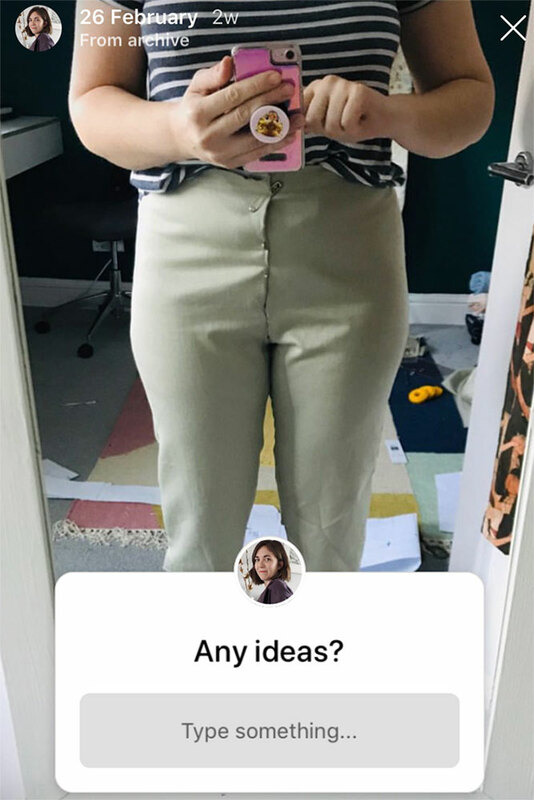 The only other tweak I made was to level off the top of the pockets to straight rather than slanted, to match the Asos inspiration suit better. I like that the deep hem at the top of the pockets matches the width of the little cap sleeve cuffs. This pattern was lovely to sew overall and unusually for me I followed the given directions almost completely, adjustments aside. 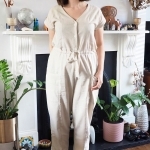 I grabbed the fabric with exactly this project in mind on a recent trip to the wonderful Abakhan in Manchester, a pre-cut piece of slubby cotton-linen blend that reminds me of silk noil costing about £8 for around 2.5m – in Abakhan you pay by weight so I wasn’t sure of yardage at the time. With creative cutting I could just squeeze the Yari pieces on (3m is the recommended yardage). 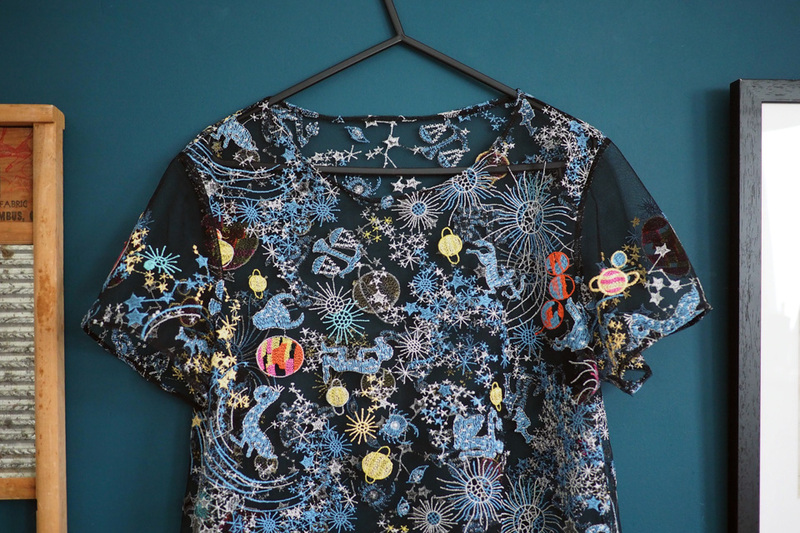 I got some of this fabric in black too and I’m tempted to use it to make a Yari sister as I reckon this will get a lot of wear as soon as it warms up a little. 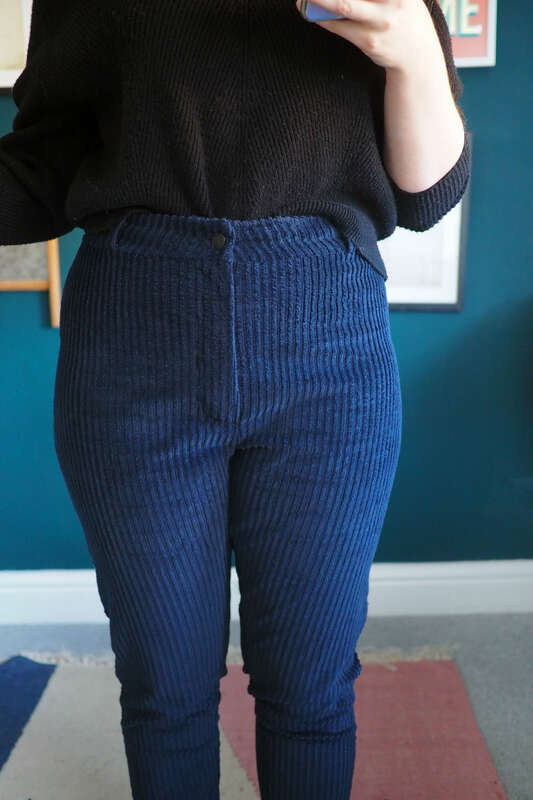 After a few sewing fails in a row (some Lander pants in a frankly hideous fabric choice, a vintage jumpsuit that looked 80s in the wrong way, some patchwork jeans that looked straight-up weird) I was so happy to finish these trousers and be 100% in love with them. 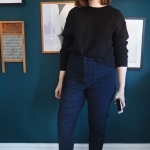 They are Anna Allen Philippa pants in a stretch corduroy from Minerva, which I received as part of being in their blogger network. 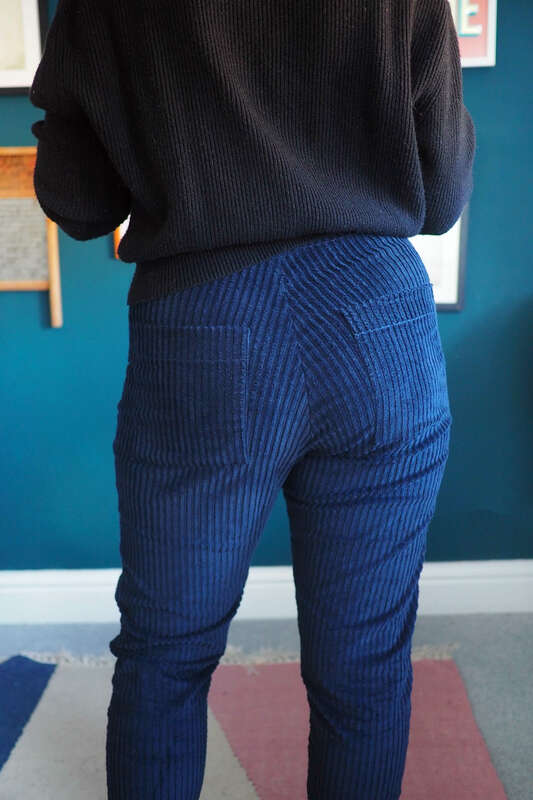 My main blog post about the pants will be going up over there later, but I thought I’d go into a bit more detail on the fitting and construction process over here. 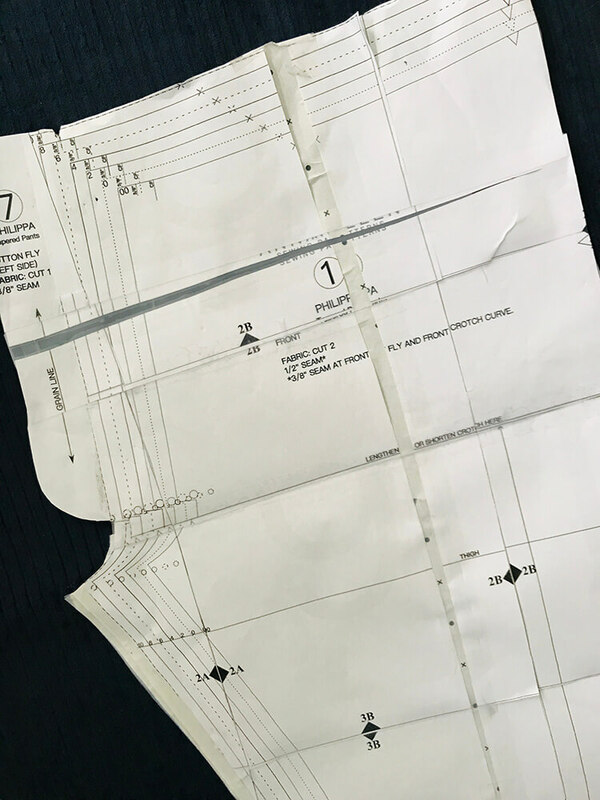 I don’t often toile patterns but I did in this case as I wasn’t at all sure what size to cut and thought I may need some adjustments to cover the size difference between my waist and hips on such a close fitting design. 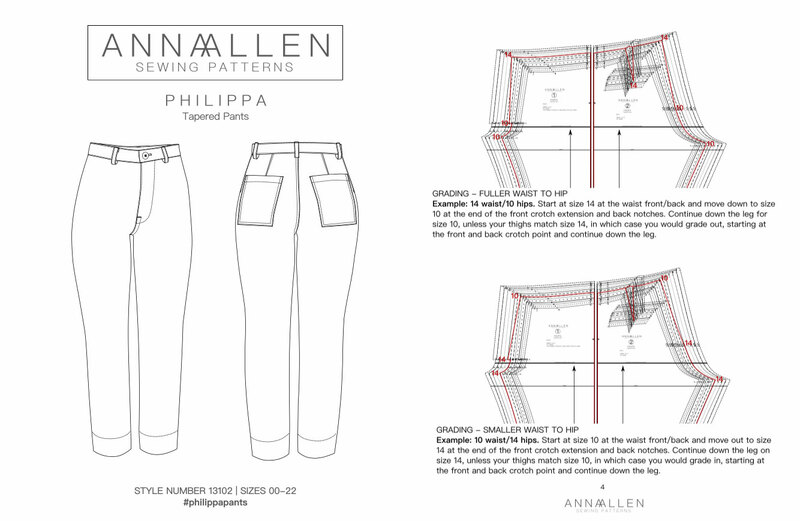 The pattern comes with a complete separate booklet of useful fitting tips and I also sought some very helpful advice on Instagram. The main consensus pointed to a full stomach adjustment, reducing the crotch depth, and giving more space in the thigh. 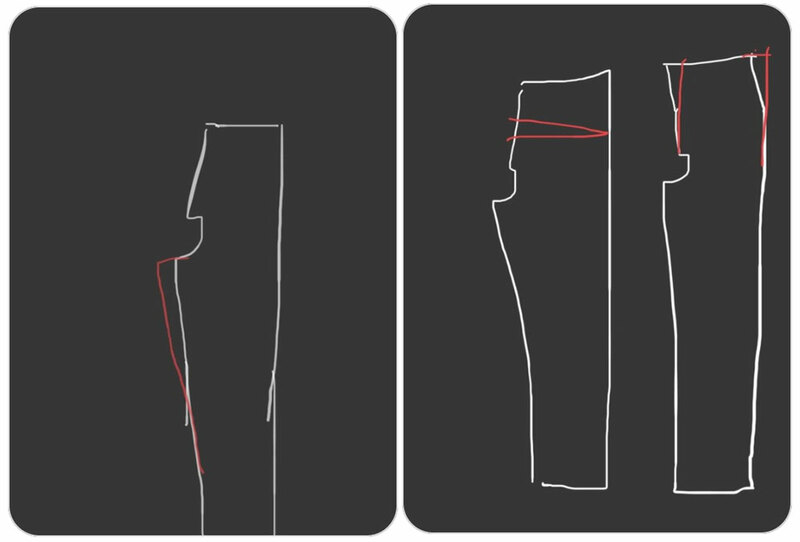 Thanks in particular to Evelyn @slowintention who sent me these diagrams showing how she did the full thigh and full stomach adjustments. 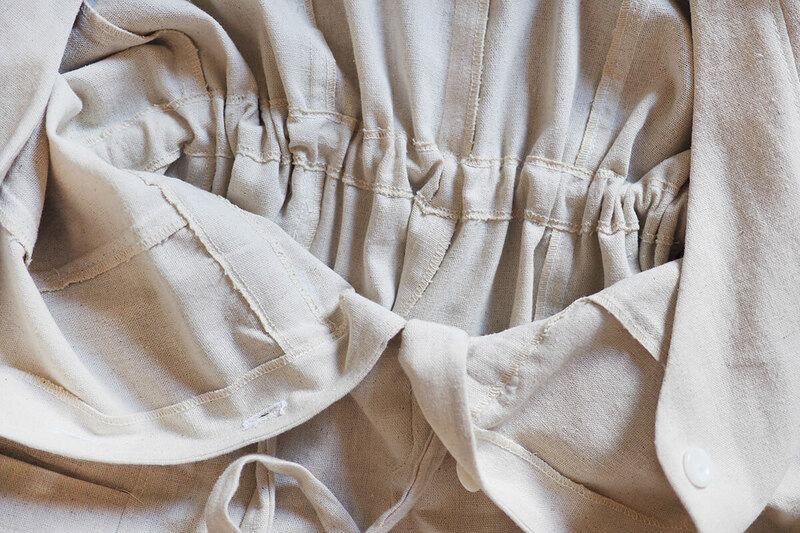 Toile 3 – which repurposed the aforementioned horrible-fabric Landers by the way. What was I thinking. Pinching out the crotch wrinkles with pins. 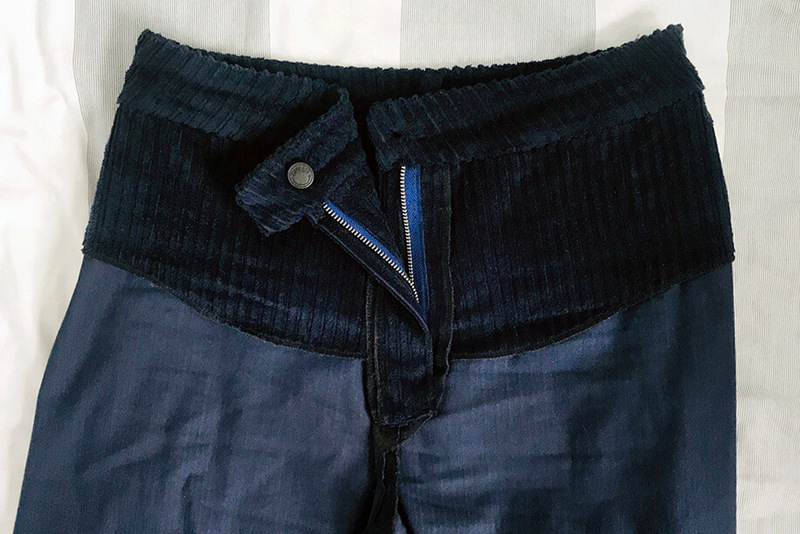 – Converted the waistband from straight to curved (a tutorial is included in the pattern for this; I only needed it because I lowered the rise to where my body curves in). 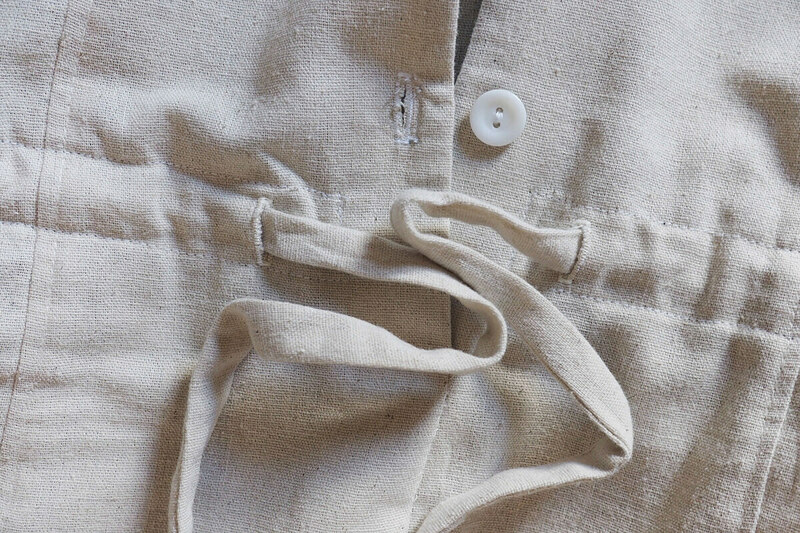 I sewed cotton tape into the top seam of the waistband to prevent stretching over time. The fit is still not perfect! 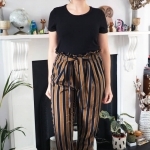 There are some diagonal drag lines on the back leg and there is excess fabric bunching around my knees – I was focusing on the waist/hip area and only toiled down to the mid thigh. The grainline seems a bit twisted too which I wonder is down to maintaining the straight side seams. But I don’t really mind! 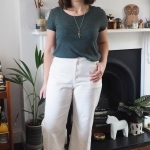 They’re crazy comfortable and I think they’re the kind of trouser that will need minor adjustment each time it’s sewn due to fabric variances. I pretty much went my own way with the construction. 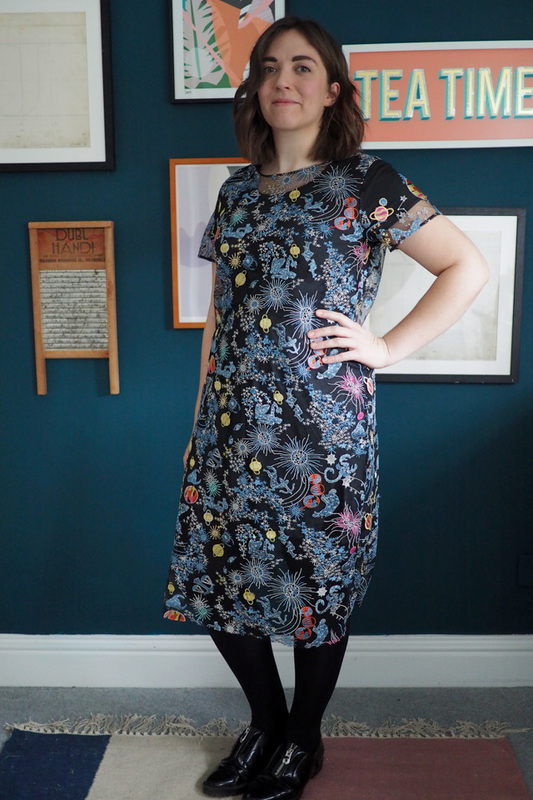 I cut-on the fly facing pieces to the main front leg and used my preferred Sandra Betzina method to do a zip fly instead of the button fly as in the pattern. I’m proud of this fly front, it’s super flat and I interfaced the surrounding area inside to keep it sturdy. The cool matte black button came as a spare with a RTW pair of jeans! 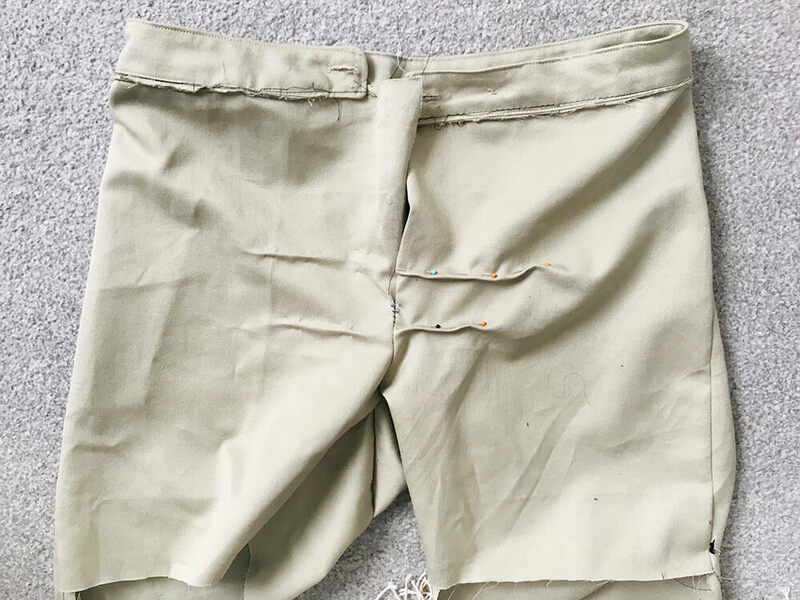 I also decided to add a sort of tummy-tuck stay piece into the front for a bit of firmness in this area – similar to a pocket stay/holster but as these have no front pockets it’s just a layer of self fabric. I used the front pieces to draft them off and anchored into the fly and side seams as they were sewn. I stretched the pieces a little as I sewed them in and I think this really helps in smoothing out the front area. 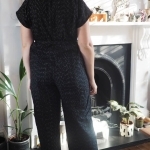 Next time I sew this pattern I will try using a non-stretch fabric as recommended, but this pair is so comfortable and I’m pleased with the fit I ended up with. 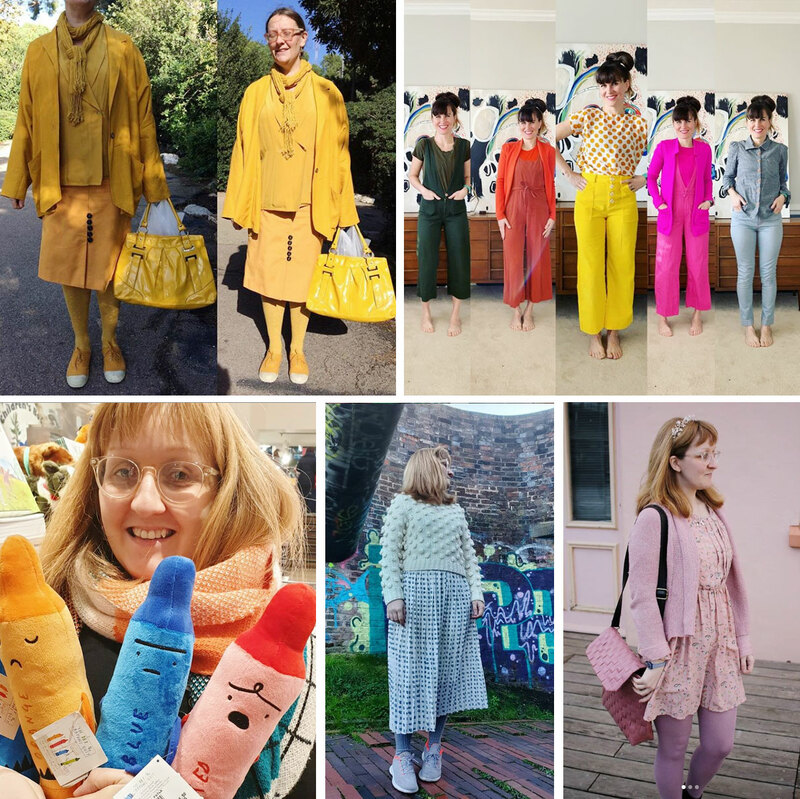 It’s has been SO nice to see #dresslikeacrayon resonating and taking off a little bit with other people on Instagram during January. 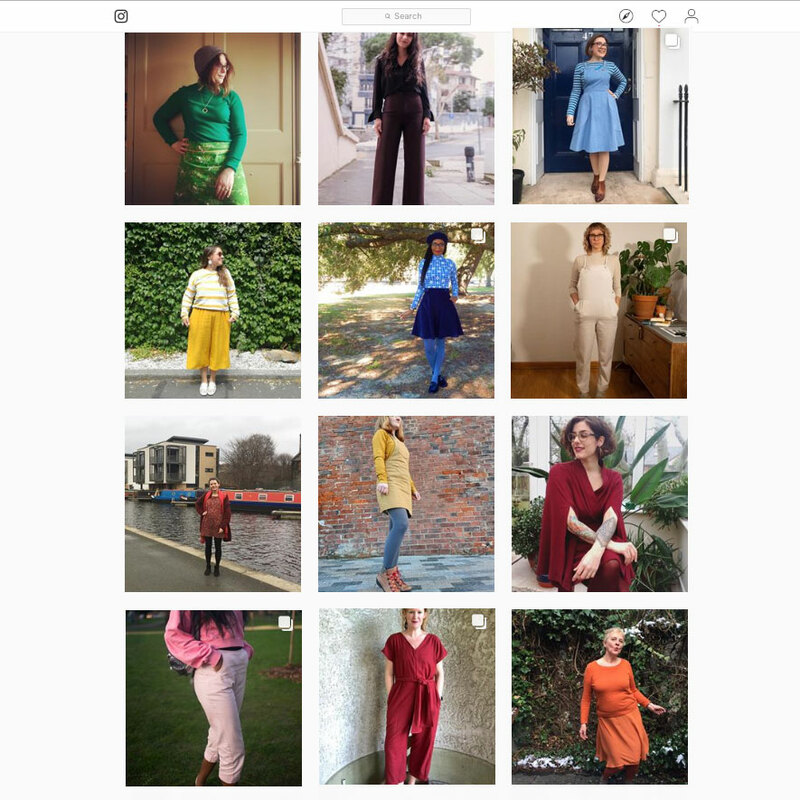 I started it primarily to kick myself into re-sharing outfits and thinking about new sewing plans, so for other people to get on board was a huge bonus. 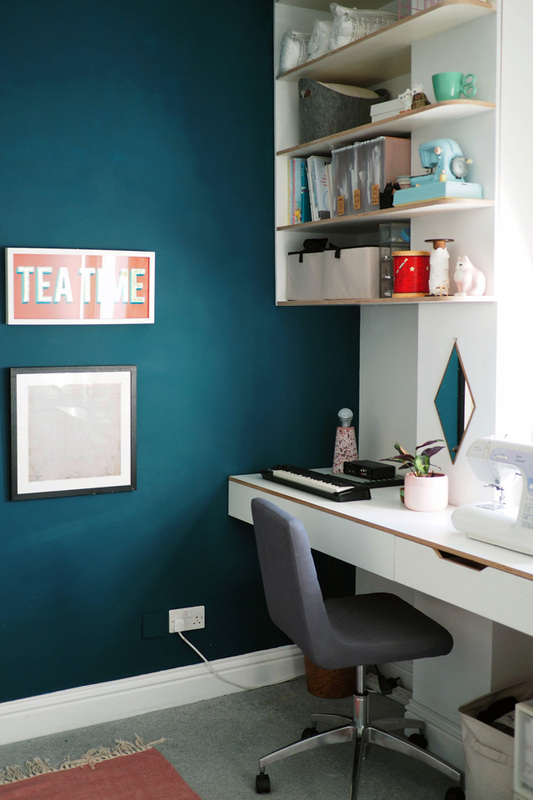 It ended up being incredibly inspiring seeing how other people crayoned; I found a lot of new folk to follow and added a lot of ideas to my sewing list! 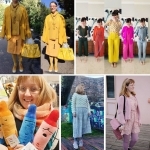 I have to give a shout out to some of the most dedicated crayoners in particular: jessiejessyg who I think was the most frequent hashtagger and most dedicated to complete-crayoning with a really eclectic range of outfits. KatieKortmanArt who again really took the theme to heart, especially with bright colours, and invented the crayon box dance! And Charlotte who shared some wonderfully textural outfits as well as a cute armful of crayons. Personally, the crayoning theme largely achieved what I hoped. 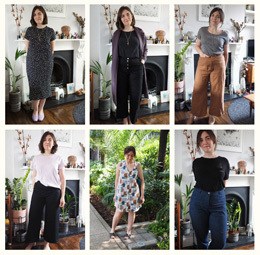 I was able to look at my wardrobe with new eyes, combine items that I hadn’t considered before, and come out with quite a clear idea of what I might be lacking in terms of adaptable pieces that my wardrobe would benefit from to unlock a load of new outfit combos. 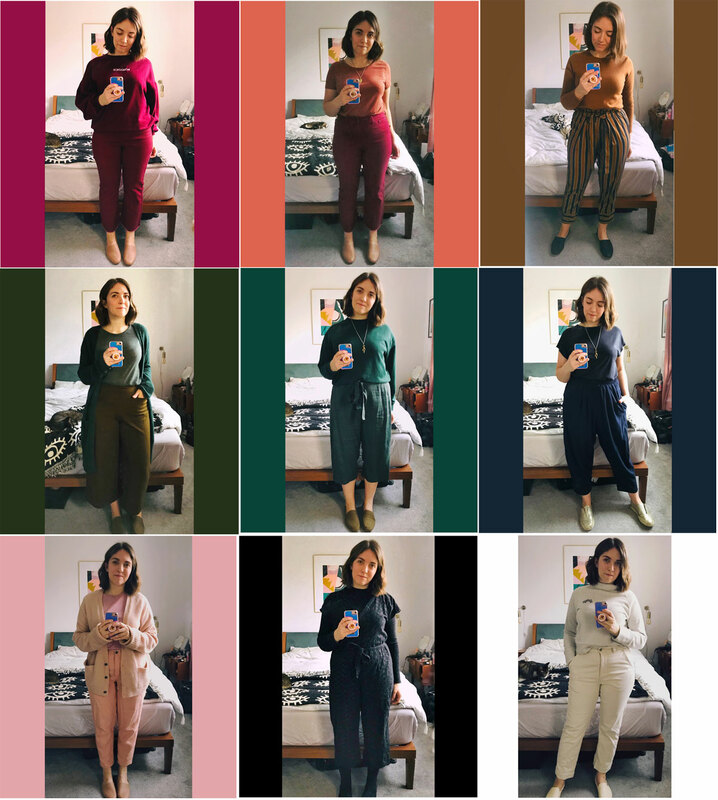 I also learned what I already expected; that since I gravitate towards a fairly constrained palette anyway I had a fair amount of crayoning choice and it definitely often reduced the time it took me to decide what to wear. I also learned that I CAN wear bright(-ish) colours and not feel horribly self-conscious. The red and green crayon outfits were some of my favourites, even if I didn’t feel completely myself in them..
That said, the theme became really difficult to follow the crayoning theme over the last couple of weeks as it got really cold and my only completely full-length pants, and winter boots, are black! So I did end up either defaulting to boring black-crayoning quite a bit or my usual pair-anything-with-black outfit formula. I fully expect to keep crayoning all year round, and I think it will only be easier and more fun in the spring. 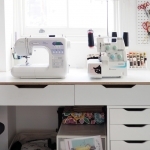 What has been added to my sewing plans as a result? 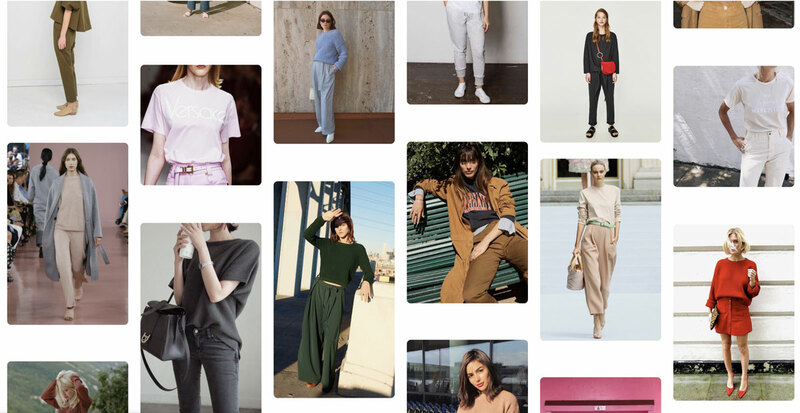 Definitely pants in more colours to pair with my collection of sweater and tops. 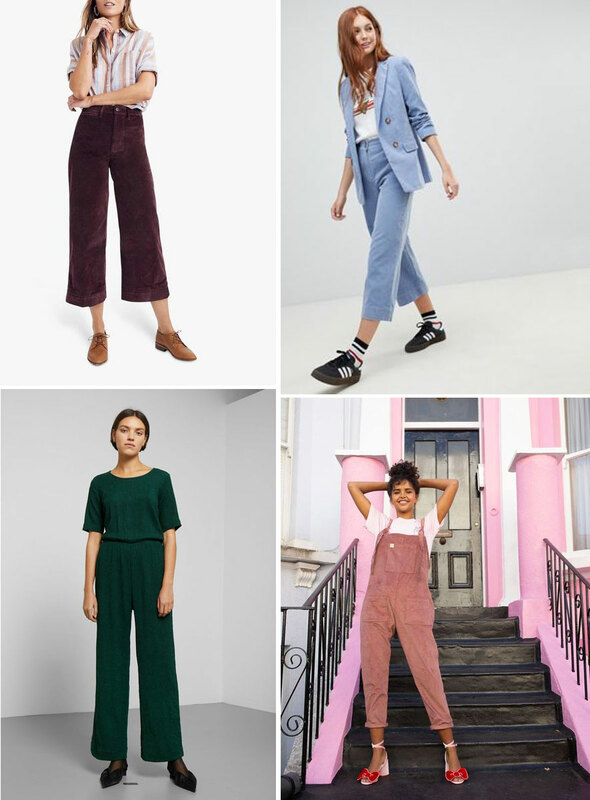 Tan/brown was a really popular colour on the hashtag and I am scouring the world for the perfect shade of corduroy for wide-leg trousers. 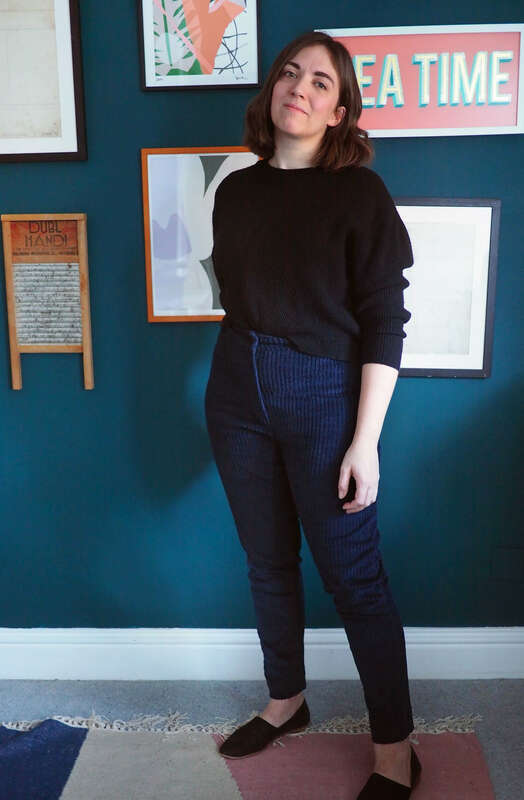 Likewise I’m fond of the idea of more powder blue, which seems to span a nice area between the logistical difficulties of wearing full-on white and the ubiquitous boringness of denim. 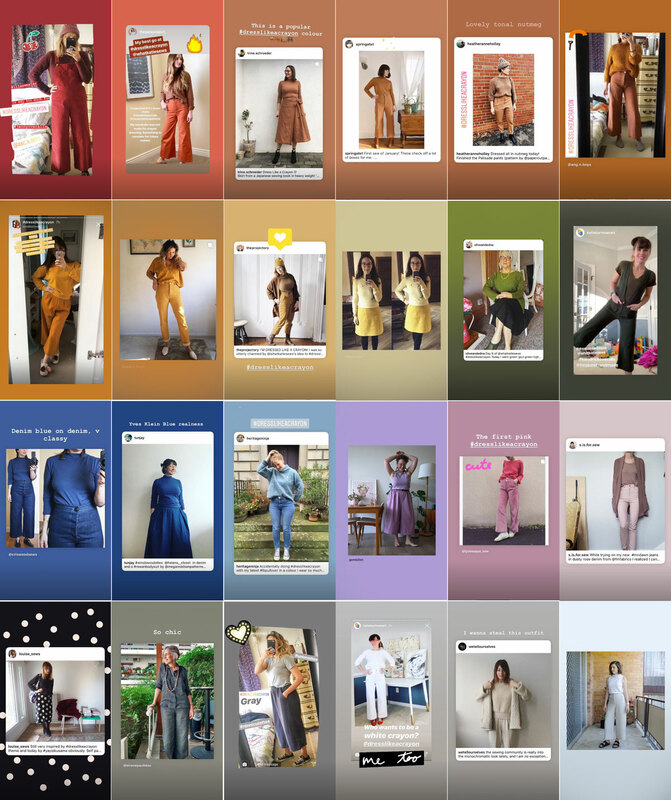 And more jumpsuits/overalls! 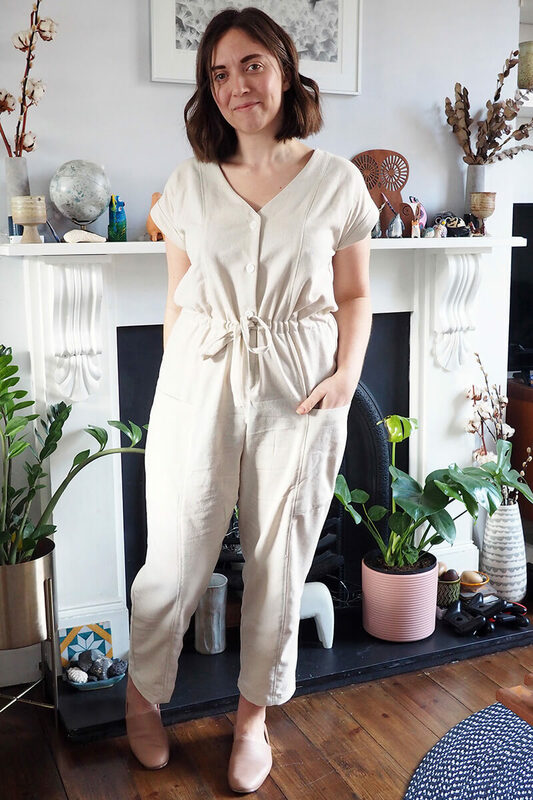 I wear my small collection of all-in-ones so frequently and they are the first thing I turn to on indecisive/nothing-to-wear days. 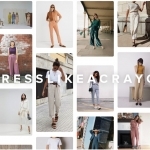 Instantly dressed, layer-able for all weathers, instant crayon. 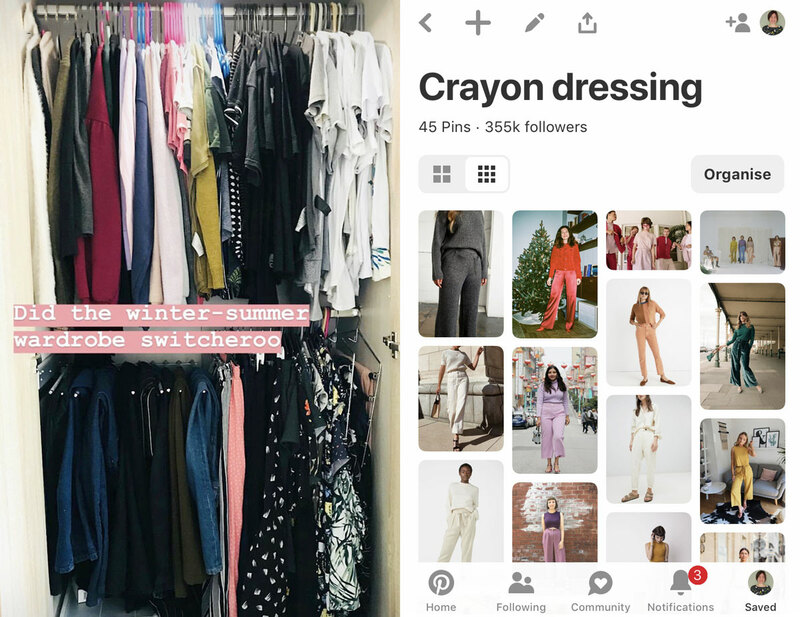 I have saved just some of the posts from the hashtag into colour-themed Instagram stories which you can explore from my profile, and I highly recommend browsing the hashtag for a dose of colourful crayon inspiration. Thank you so much to everyone who’s taken part, it’s been such a joy to ‘host’ and kick off this fun theme. Keep at it! I’m a million miles late joining the fun #sewfrosting challenge started by Heather and Kelli before Christmas, but I finally got around to photographing two fancy dresses I’ve made in the last couple of months, both of which have been successfully party-tested already. 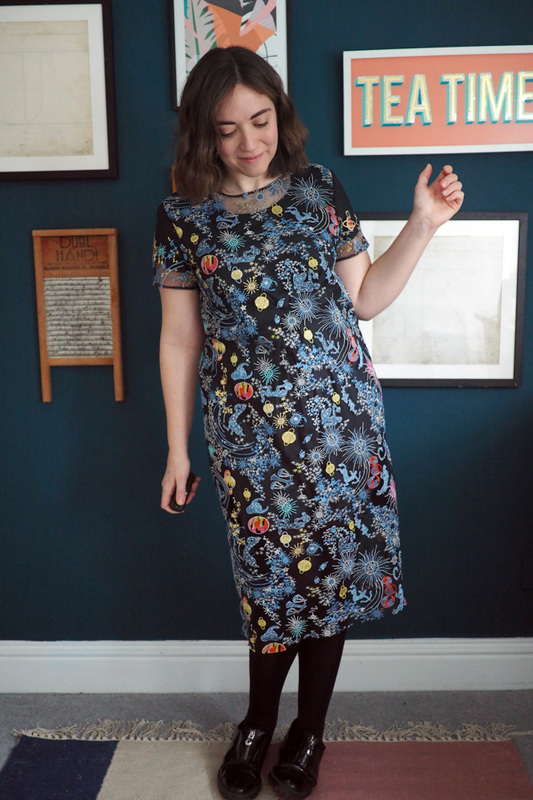 First up a jazzy dress I wore for my birthday party last weekend. 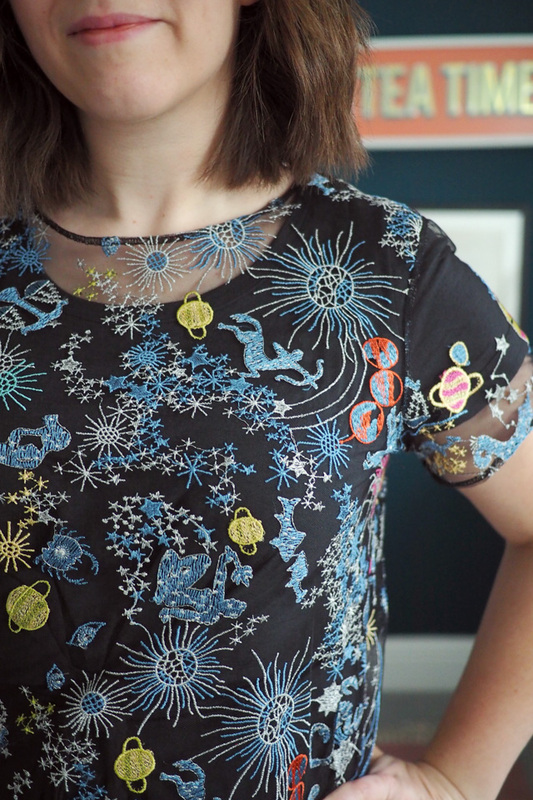 I bought this amazing outer space embroidered tulle from Stonemountain & Daughter last year (it still seems to be in stock!). It cost me an absolute fortune in shipping and custom fees but luckily it was worth it. I only got 1.5yds so had to do some very careful cutting to get the midi length dress I wanted with decent pattern placement. I had basically zero scraps and the shoulders with no embroidery are eating riiiiight into the selvedge, heh. I wanted a dead simple pattern and used this Stoff & Stil pattern that I threw in out of curiosity in a recent fabric order. 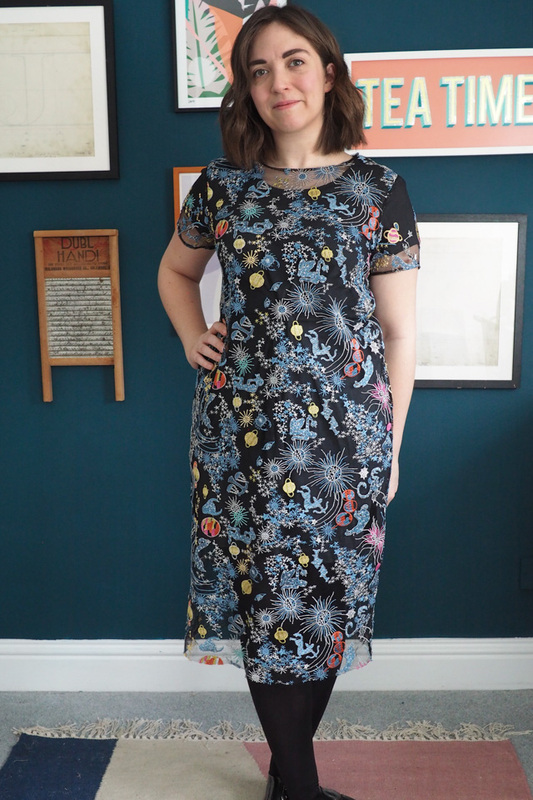 They have an awesome range of patterns for cheap prices in very cool, wearable styles. They come single size, and unusually come pre-cut in whole (non-halved) pieces and made out of a lightweight fabric-like material. I imagine you could tissue-fit the flat pattern with pins very easily prior to cutting. I liked working with the pattern a lot, the grippy fabric pieces made cutting really easy and the nice big bellows envelope makes it easy to re-store the pieces. 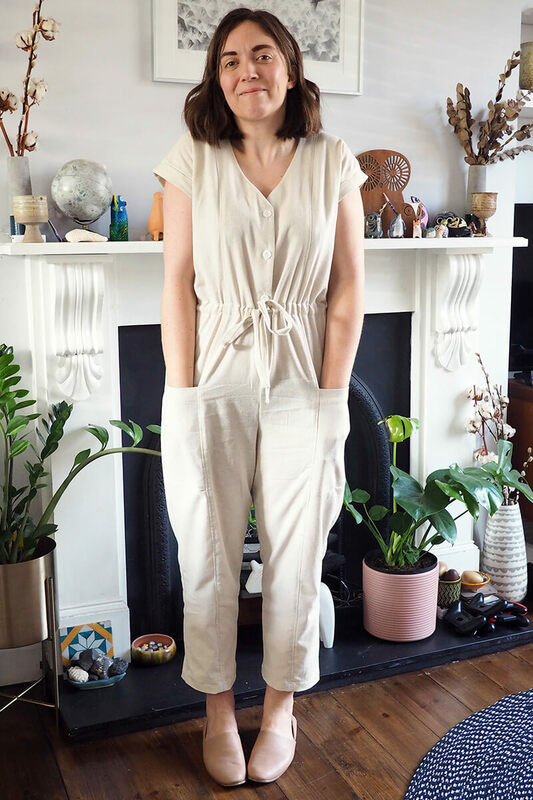 I had to adjust the fit as the size that fitted my hips was way too big on the shoulders and chest, so I sliced down from mid-shoulder to hem and overlapped the pieces, tapering to less as I went down. 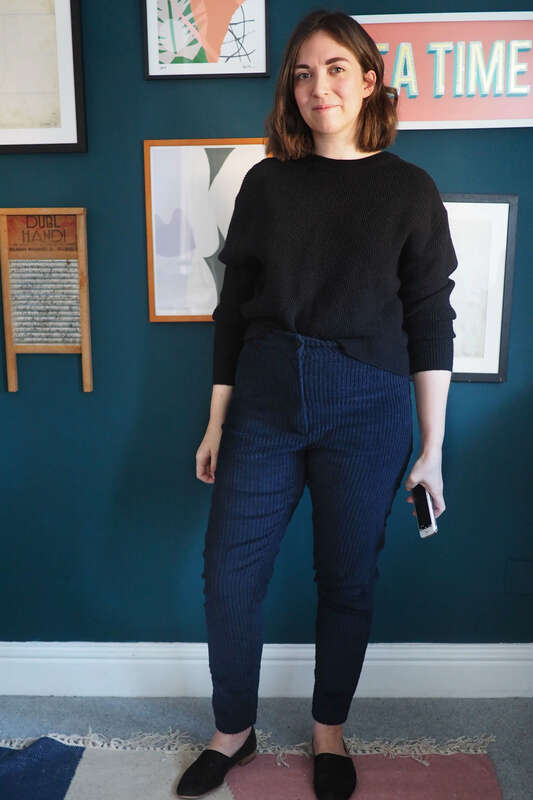 Otherwise the fit is great and will likely become a TNT for simple tee dress shapes. I thought carefully about seam and hem finishes in this very transparent tulle. I tested French seams but they looked pretty horrible, so in the end decided to overlock then press and topstitch down to one side. 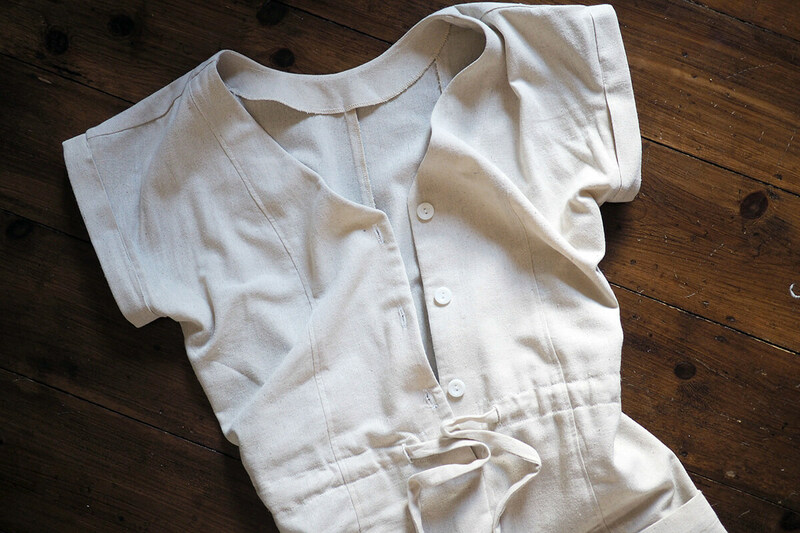 Similarly for the neckline and sleeve hems I overlocked the raw edge, finger-pressed it back twice and topstitched. The hem is still raw! 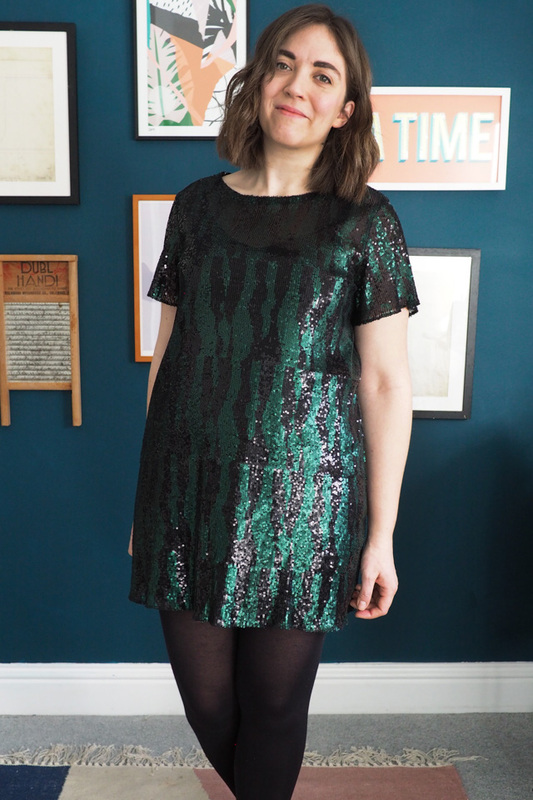 I confess I was finishing the dress five minutes before I got out the door for my party but hey, sometimes fuss-free (non)finishes are the best and who’s looking that closely when you’re covered in sparkly planets and stars. 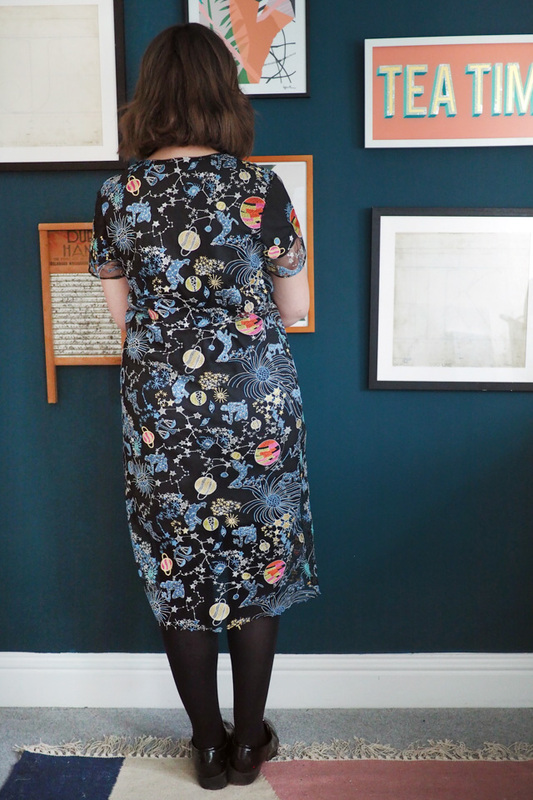 The transparency also necessitated an under-layer which I hadn’t really considered; in a pinch I wore an Inari knit dress I made a while ago. It’s not ideal as it’s looser fit and the ties add some bulk, so at some point I’ll make a simple close-fitted tee dress to wear underneath. Here’s the dress looking cool under a blacklight in a bar, and doing some serious karaoke, my two preferred birthday activities. I used the same pattern before Christmas to make a mini dress for my company’s Christmas party. 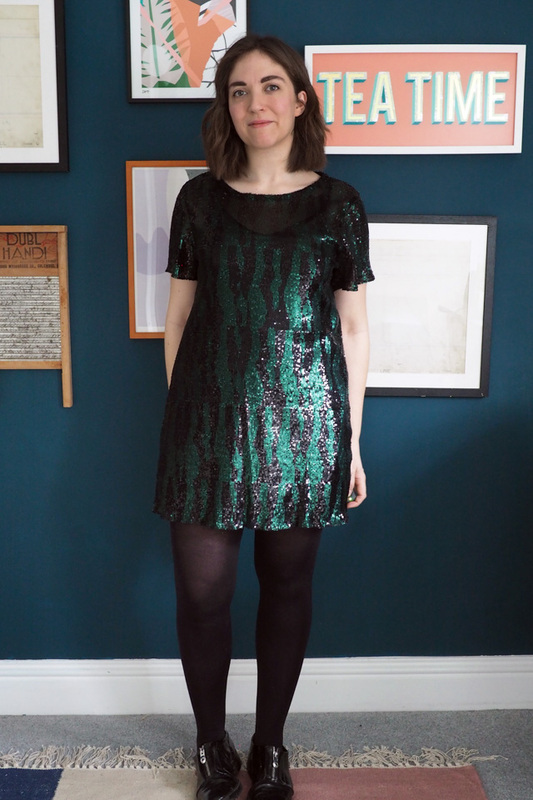 It had a ‘red, green and/or sparkly’ dress theme so this excellent snake-y sequin fabric I bought a year or so ago (also from S&S but sold out now) was perfect. It is also quite sheer so I’m wearing a black Ogden cami slip I made a while ago underneath. 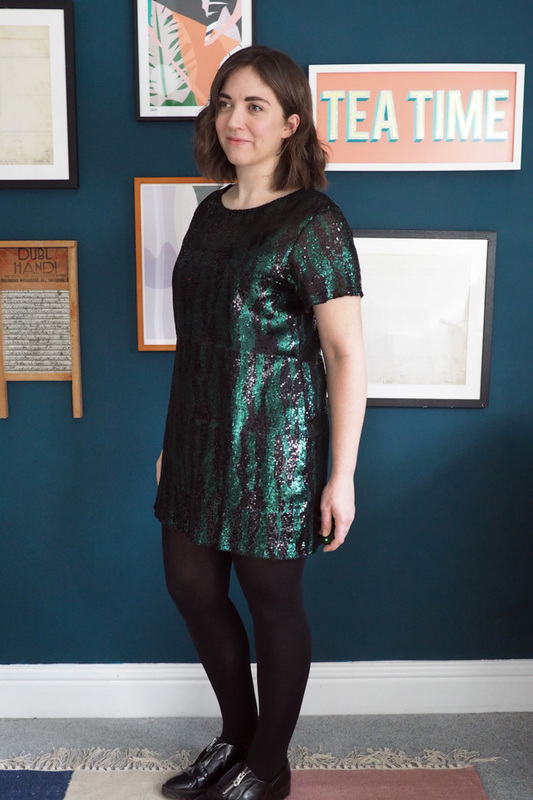 This was my very first time working with sequins, but luckily it was a gentle introduction! 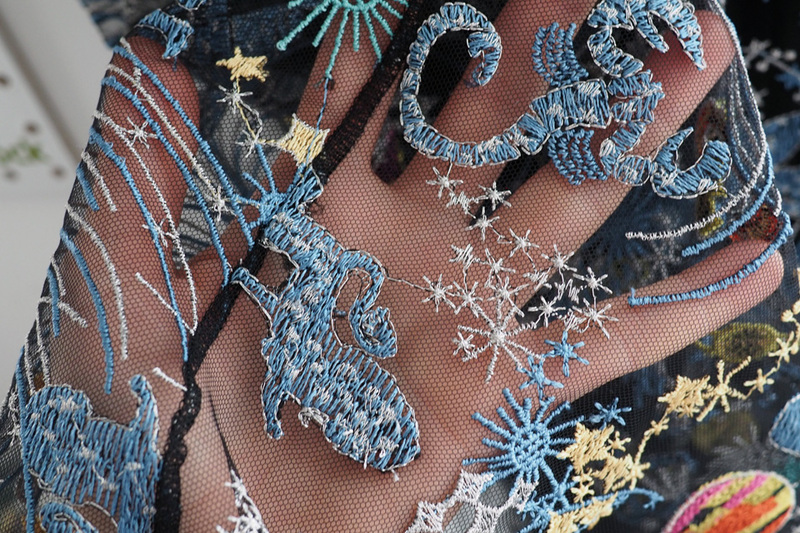 Crucially the sequins are pliable enough that they could be cut and sewn straight through, no need to remove them from the seam allowances. 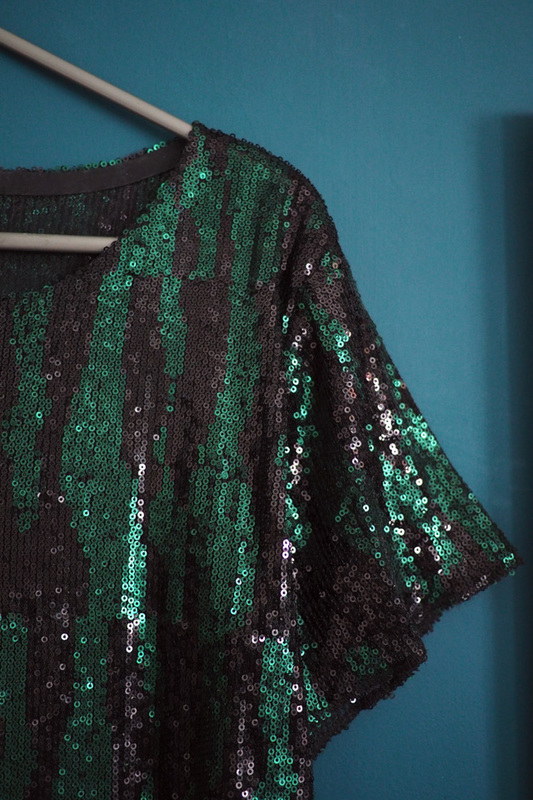 I finished the neckline with purchased black bias tape facing, which I handsewed down – stitching into the mesh means the sequins cover it and it looks invisible. The other hems are rather shamefully just overlocked and left plain. 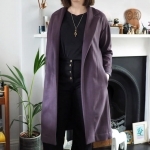 I tried the same bias finish on one of the sleeves but it made it flute out weirdly, and actually I like the weightless look and near-invisible finish of the black overlocking. The great thing is this simple tee shape is so comfortable and forgettable to wear, but the fancy fabrics make them still feel special. That’s ideal frosting for me! 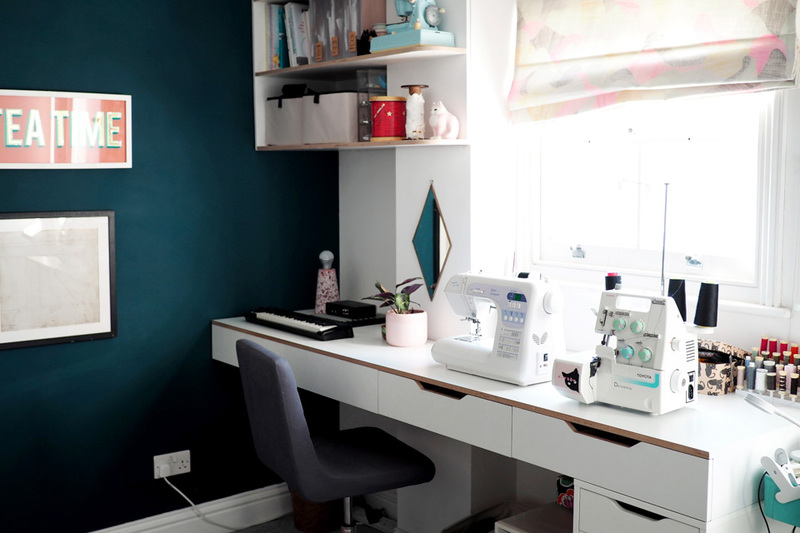 I last shared my sewing space back in 2015. 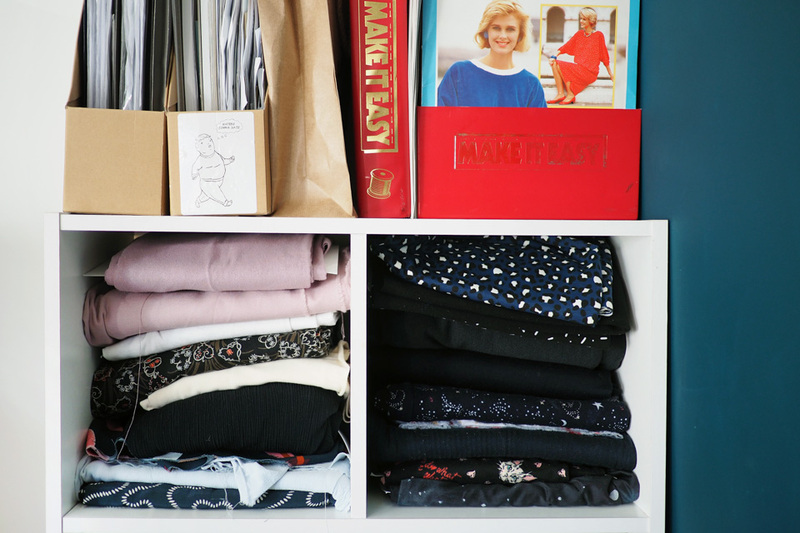 Nothing has massively changed but between Christmas and the new year we had a clear-out, reshuffle and redecorate so I thought I’d take some new photos! 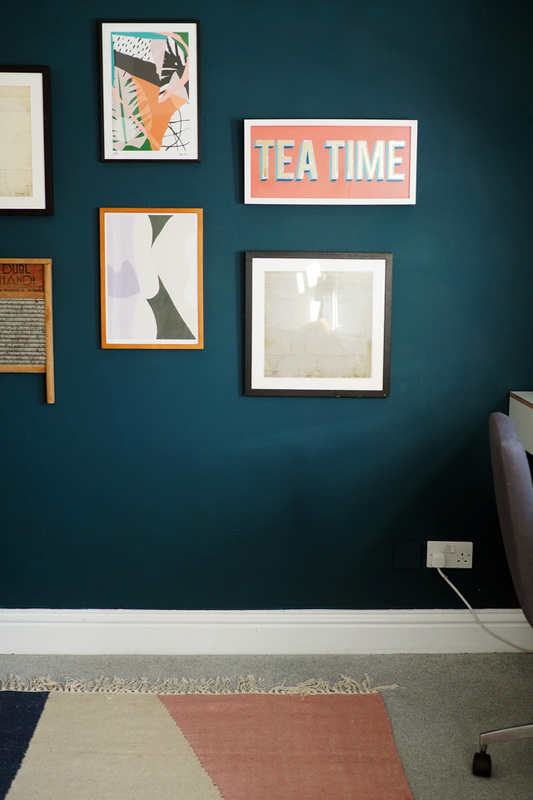 The most noticeable change perhaps is my new greeeeen wall (even though it looks more blue in the photos for some reason). This was quite a rash decision and I didn’t even sample the colour or anything; luckily I like it and it only took a few hours to paint. I may take my project photos in here from now on as the light is really nice in this room, so expect to see plenty more of it soon. The plywood desk and shelving unit I had made back in 2015 are still holding up well. I painted the backboards of the shelves white as they always looked quite overbearing in the ply; they blend much better into the wall now. 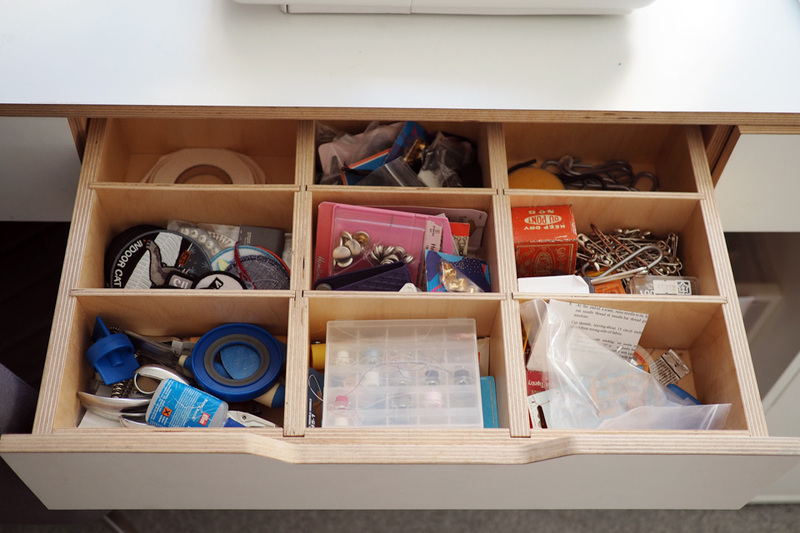 I’ve moved my fabric into a separate unit as having stuff boxed away looks tidier up here. The lower shelves hold frequently needed stuff like interfacing and machine feet, and up top is lesser used stuff like quilt batting. 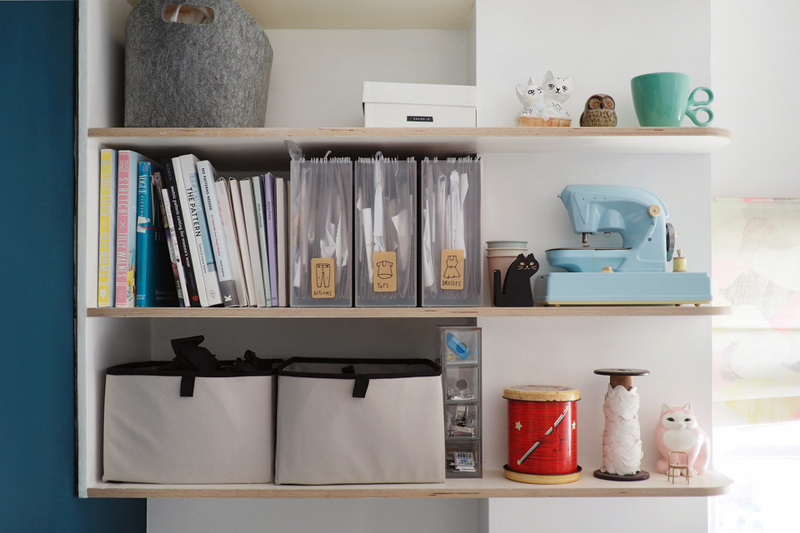 My PDF patterns are stored as before in Muji divider files. 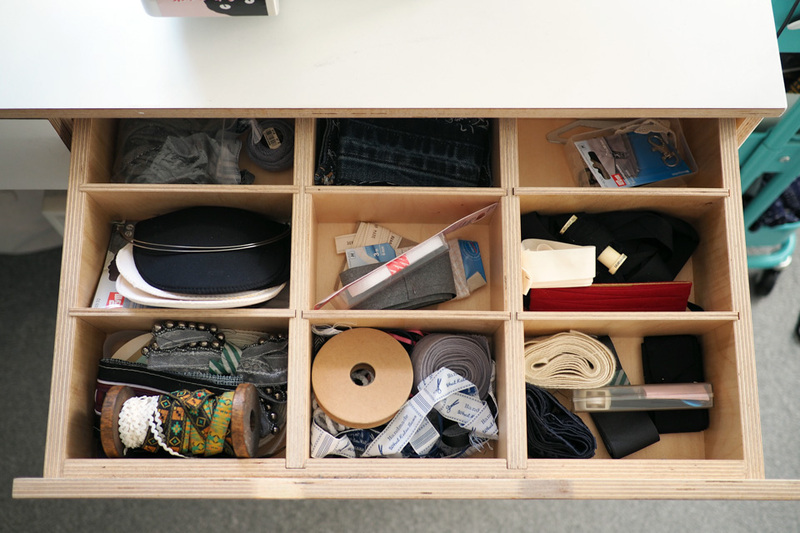 The deep compartmented drawers I designed for the desk are so useful for all those bits and pieces you need on hand: chalk, safety pins, fastenings and so on. I also kept my trusty sewer’s friend the Ikea Raskog trolley to store bulkier things like threads and pressing hams. The clip LED light is useful for detail work, especially as my overlocker light is blown and I don’t know how to change it, ha ha. The other larger thing we changed is moving the trundle bed we used to have here into the other spare room and making this a joint ‘hobby room’ for Josh and me. Josh homebrews so he needs a lot of kit as well, which is in this chest and tucked to the other side of it – there’s an ugly but necessary black fridge and a load of unphotogenic demijohns, ha. Still there’s more floor space now which is really useful for cutting out large projects. 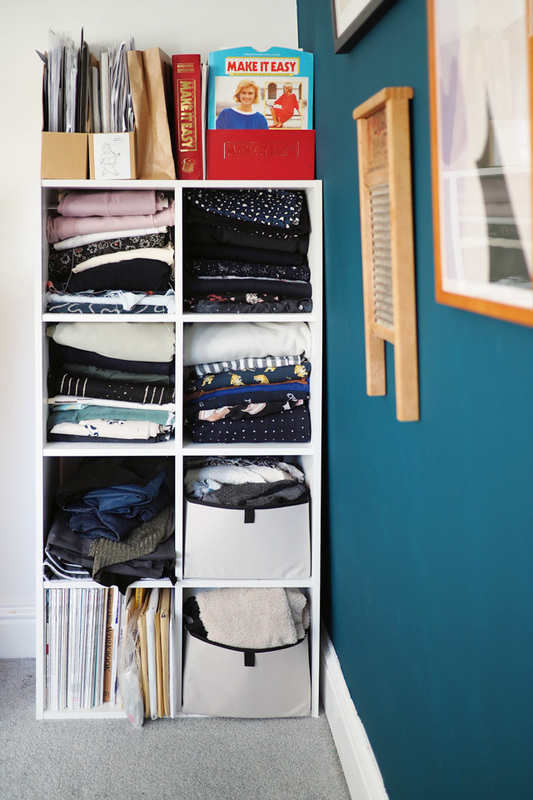 I had this little unit already, it stored books before but it’s the perfect width to store fabric. 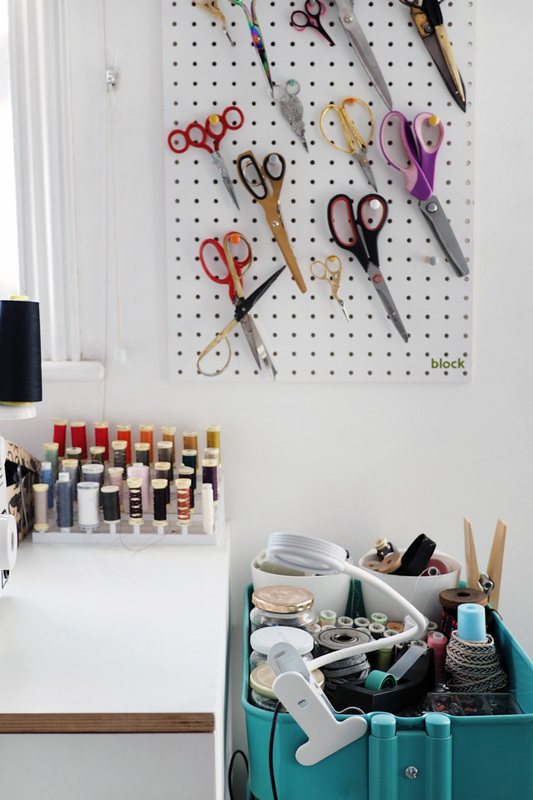 Each length is wrapped around a comic book board to keep it tidy. 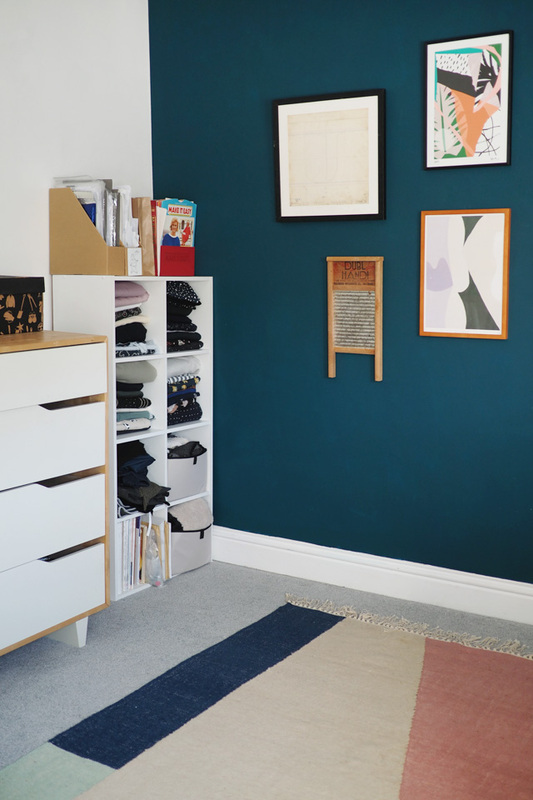 The lower shelves hold scraps, PDF overflow and back issues of my beloved Threads magazine. 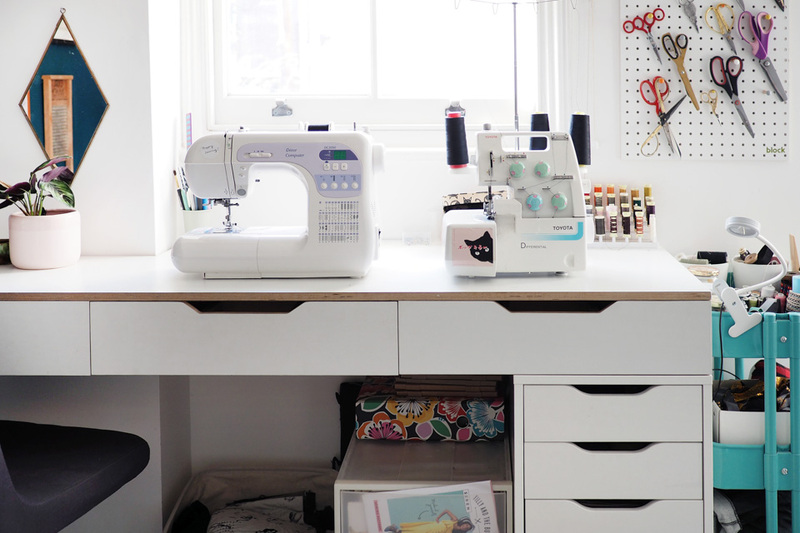 I’m really pleased with how the little refresh turned out, it’s already motivating me to sew more! The days are slowly getting longer and brighter as well so hoping I can get back into taking project photos as it’s been ages since I shared anything. It’s been so long that WordPress’s post editor has changed which is taking some getting used to, anyone else finding it a bit difficult?! Hope you liked seeing my room anyway and ask if you have any questions!